Aha !! Long time has passed since my last post. More to that, when I hovered my site, no Paneer recipe yet!! The trade mark recipe of every Indian vegetarian favorite was missing !! Then, all of a sudden the tiny little cook in me craved for Paneer. When I think of Paneer I either land up cooking it with lots of Onion and Capsicum or end up making a sweet version. These are loved in my family. However, I realized it was certain festival day and the food had to miss Onion and Garlic. Hmmm… You have to cook your way on a working day and with limited ingredients. Then, I saw mutter (Green Peas) lying in the fridge and that gave me a sense of relief. That instant, the idea of cooking Mutter Paneer got into my head. It is a great company to chapatis. Peel the fresh Green Peas or defrost the frozen ones. As it’s winter I got a fresh bunch of green peas. Wash it off and pat dry. Cut the Paneer into big cubes of sides 1 inch each. Make a fine paste using Ginger, Cashew nuts, Red chillies, Cumin seeds and Tomato. Before making the paste, ensure that you cut the tomatoes into small pieces, this will help in grinding. Heat a pan, add 1 tbsp Oil. Once the Oil is heated up, add the Paneer cubes and a pinch of salt. Fry till slight golden brown. The Paneer shouldn’t be fried long otherwise it’ll get a rubbery texture. After the Paneer is fried, keep aside the cubes. Add the Green Peas to the same Pan and add a pinch of salt. Fry the Green peas for 2-3 mins and keep the fried ones aside. Add the remaining 2 tbsp Oil in the Pan and heat it for 1-2 mins. Once the oil in the Pan is heated up properly, add the finely ground spice or masala. Add turmeric powder, coriander powder and salt to taste to the masala and saute it for 3-4 mins. Keep frying it until the oil oozes out of the finely ground spice or mixture. Add the fried paneer cubes and fried Green Peas and saute the mixture for 1 min. Then add a cup of water to make a decent gravy for the curry. Let the curry simmer for 2-3 mins , so that the gravy thickens. Garnish the Curry with fresh Coriander leaves for some freshness in the smell and serve it hot with chapatis. It’s a delight to every vegetarians taste. 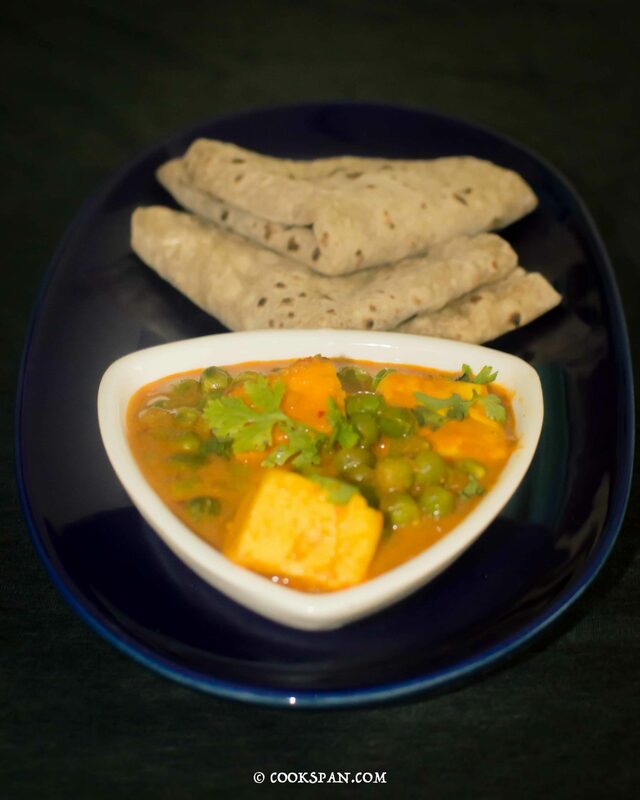 No onion no Garlic version of Mutter Paneer is a creamy, tangy gravy dish of Paneer (Cottage Cheese), which goes perfectly with any form of Indian bread and is a favorite among Indian vegetarians. Thank you !! I’m glad you liked this recipe.